2. Cut beef into 2 cm pieces and cook in 5l pot with 2l of water, 2 bay leaves and salt for 40 minutes. 3. Drain chick peas, add to the pot and cook with the meat for 30 minutes. 4. 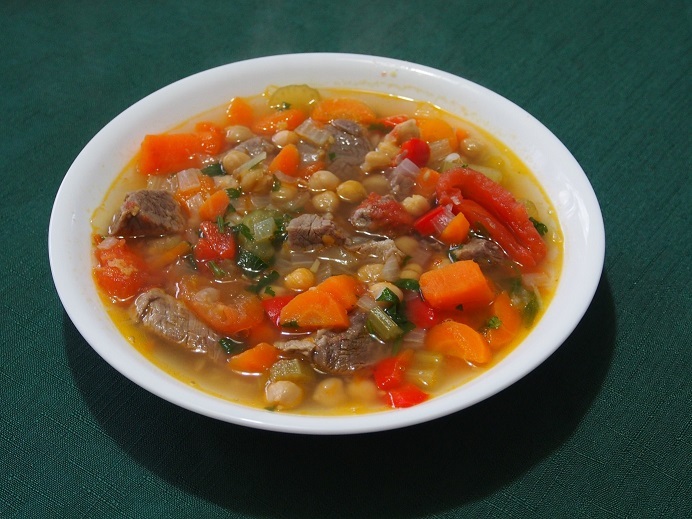 Cut vegetables and when the chick pea is soft add onions, carrots, capsicum, sweet potatoes and celery to the pot. Keep the pot on low/medium heat to simmer. If using canned chick peas, add them here. 5. In the meantime, cut Roma tomatoes in halves. Spray a separate pan with olive oil and cook tomatoes covered for 5 minutes on low heat. Transfer the tomatoes from the pan and put aside to cool. 6. Reuse the pan to cook finely chopped or crushed garlic for 1-2 minutes on very low heat. When tomatoes are cool enough to handle remove the skin and return back to the pan. 7. Add Besan flour to the tomatoes. While mixing the flour through, cut the tomatoes into smaller pieces using the spoon. Proceed for 1-2 minutes. 8. Add tomatoes mixture to the pot, mix well and try for salt and readiness. Add lemon juice and chopped fresh parsley and the stew is ready.